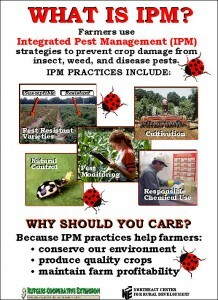 Designed especially for farm market display, this attractive IPM poster helps inform farm market clientele about Integrated Pest Management practices. . A master copy of the fact sheet ‘What is IPM’ is provided. The poster measures 16” by 24” and is laminated to withstand farm market conditions. For shipping & payment information, contact Norma Stopek @ phone: 732-932-9801 or email: stopek@aesop.rutgers.edu.